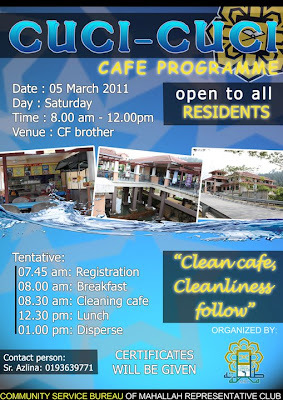 Community Service Bureau will be organizing "Cuci-cuci Cafe" program tomorrow, 5th March 2011. With the spirit of "Cleanliness is half ot faith", let's support this programme by joining it. Once in a blue moon, let us clean the very place all of us by food at, so that at least once in a while we can have a "better mood" when buying food for our stomach. CS bureau needs at least 50 people for this program. I'm sure they will welcome if more are willing to come. 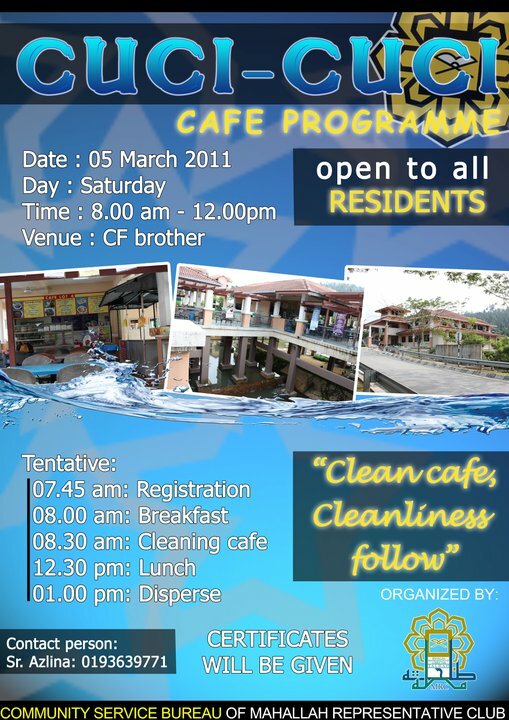 Insya-Allah, let's do our duty as residents and as muslims, loving all things clean, for Allah loves cleanliness too. May Allah Taala reward us for our sincerity.